An automated platform that can synthesize a wide range of complex carbohydrates will greatly increase their accessibility and should facilitate progress in glycoscience. Here we report a fully automated process for enzyme-mediated oligosaccharide syn-thesis that can give easy access to different classes of complex glycans including poly-N-acetyllactosamine derivatives, human milk oligosaccharides, gangliosides and N-glycans. Our automated platform uses a catch and release approach in which glycos-yltransferase-catalysed reactions are performed in solution and product purification is accomplished by solid phase extraction. We developed a sulfonate tag that can easily be installed and enables highly efficient solid phase extraction and product release using a single set of washing conditions, regardless of the complexity of the glycan. Using this custom-built synthesizer, as many as 15 reaction cycles can be performed in an automated fashion without a need for lyophilization or buffer exchange steps. 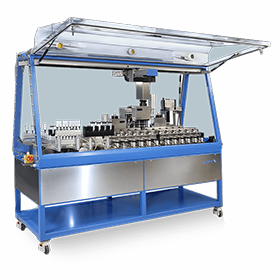 Combinatorial and high throughput (HTP) methodologies have long been used by the pharmaceutical industry to accelerate the rate of drug discovery. HTP techniques can also be applied in polymer chemistry to more efficiently elucidate structure–property relationships, to increase the speed of new material development, and to rapidly optimize polymerization conditions. Controlled living/radical polymerization (CLRP) is widely employed in the preparation of potential materials for bioapplications being suitable for a large variety of polymeric materials with various architectures. The versatility of CLRP makes it an ideal candidate for combinatorial and HTP approaches to research, and recently, the development of oxygen tolerant CLRP techniques has greatly simplified the methodology. In this Perspective, we provide an overview of conventional CLRP, including automated parallel synthesizers, as well as oxygen tolerant CLRP applications for HTP polymer research. We report a methodology using machine learning to capture chemical intuition from a set of (partially) failed attempts to synthesize a metal-organic framework. We define chemical intuition as the collection of unwritten guidelines used by synthetic chemists to find the right synthesis conditions. As (partially) failed experiments usually remain unreported, we have reconstructed a typical track of failed experiments in a successful search for finding the optimal synthesis conditions that yields HKUST-1 with the highest surface area reported to date. We illustrate the importance of quantifying this chemical intuition for the synthesis of novel materials. High‐throughput synthesis offers reliable experimental techniques for the rapid investigation of polymerization parameters as well as for the preparation of comprehensive polymer libraries with systematic variations for screening against different applications. This contribution summarizes the use of different high‐throughput methods available for the synthesis, characterization, and screening of polymeric materials. A critical viewpoint regarding the advantages, impact, current limitations, and future developments of these experimental techniques is also provided. High-throughput methods represent a very promising approach for the acceleration of soil contamination analysis. 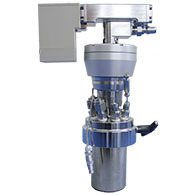 With increasingly stringent regulations, enhanced environmental consciousness, different soil origins and characteristics, and a vast number of analyses to perform, the FLEX POWDERDOSE provides the perfect solution to quickly and flexibly dispense any soil type in different container formats (cuvettes, vials, bottles, reactors, etc.) and provide immediate answers to demanding customers. A large number of samples can be prepared in one batch to be used for several contamination analyses: elution, mineralization, extraction and much more. 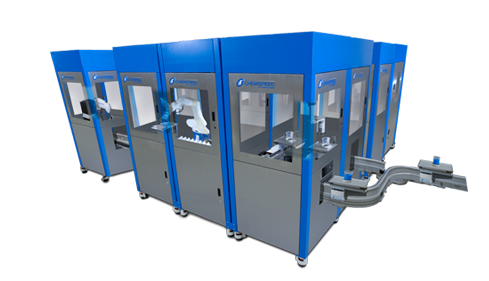 The CSIRO Rapid Automated Materials and Processing Center (RAMP) synthesized nearly 1’500 individual polymers in 10 days at a 0.5-1.0 g scale, using a Chemspeed Technologies ISYNTH. The CSIRO’s RAMP facility has been established to accelerate the development of new advanced materials and processes by matching robotic and automated equipment with the expertise of key scientists in one location. Supramolecular synthesis is a powerful strategy for assembling complex molecules, but to do this by targeted design is challenging. This is because multicomponent assembly reactions have the potential to form a wide variety of products. High-throughput screening can explore a broad synthetic space, but this is inefﬁcient and inelegant when applied blindly. Here we fuse computation with robotic synthesis to create a hybrid discovery workﬂow for discovering new organic cage molecules, and by extension, other supramolecular systems. A total of 78 precursor combinations were investigated by computation and experiment, leading to 33 cages that were formed cleanly in one-pot syntheses. Comparison of calculations with experimental outcomes across this broad library shows that computation has the power to focus experiments, for example by identifying linkers that are less likely to be reliable for cage formation. Screening also led to the unplanned discovery of a new cage topology—doubly bridged, triply interlocked cage catenanes. The Drug Enforcement Administration’s (DEA) Heroin Signature Program (HSP) and its Heroin Domestic Monitor Program (HDMP) aim to increase the DEA’s ability to identify the geographic origin of heroin in the U.S. wholesale and retail markets. These programs also gather data on heroin purity levels and trafficking trends into and across the United States. Both these programs require that many hundreds of heroin samples be analyzed at the DEA Special Testing and Research Laboratory (SFL1) every year. 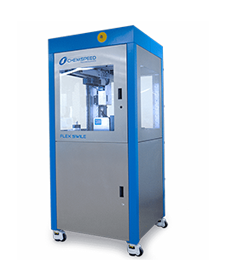 The DEA chose Chemspeed Technologies to provide an automated sample preparation platform to help handle this challenging workload by increasing throughput of sample analysis.